While everyone might be currently focused on the future of gaming with E3 2018 having not long finished, the present is still very much active too, the Nintendo eShop constantly getting a healthy dose of new releases added to its storefront. Just Shapes and Beats is one such example – a game that combines simplicity, style and music to craft an experience no Nintendo Switch owner should miss. The general idea of the game is a very simple one. Move a small shape around the screen making sure to avoid pink attacks that take form to the beat of the music track itself. These coloured assaults might be something as simple as a series of small, slow-moving circles to more intimidating beasts like giant rotating cubes that fire smaller projectiles, snakes and rising waves. Take one too many hits from these pink patterns and you’ll be sent back to last reasonably placed checkpoint. While the idea of dodging simple shapes may not sound too stimulating, when timed with the game’s sensational soundtrack you have a winning formula that’s tough to put down. As stages become more complex, you’ll want to make strong use of your one and only real ability – dashing. This one button manoeuvre not only allows you to dart quickly over a short distance but also makes you temporarily invulnerable to any damage. With each stage harbouring its own unique series of attacks, you’ll find yourself relying on this extremely useful perk often. There’s a surprising amount of modes and options included in Just Shapes and Beats all playable co-operatively for up to four players. While the goal remains the same regardless (avoid anything pink) being able to revive a fallen teammate is a nice addition and creates some rather tense moments as players are slowly whittled away one by one. Story Mode is perhaps the best place to start when you first load up the game, the adventure getting you used to each stage while tying it all together with a strangely charming story. Challenge Mode removes the excess and simply puts you in a series of stages with up to three other players either locally or online. Unlike Story Mode, here you’re awarded a grade and coins based on your performance – the latter of which unlocks more songs. Whether sharing a screen or joining a group of strangers online, Challenge Mode is great fun in getting you right into the action quick and seamlessly. Playlist Mode is basically your “choose whatever song you want” option while Party Mode is a non-stop session playing songs one after the other with unlimited lives and no end in sight. Unfortunately, a game that uses music to dictate its attack patterns, as cool as that is, also requires a good chunk of trial and error, especially when getting to grips with a song for the first time in Story Mode. While taking damage from unpredictable attacks isn’t so bad during regular stages thanks to a fairly forgiving checkpoint system, the same can’t be said for the checkpoint-less boss battles. As exciting as these are, the lengthy encounters can prove a little too tough as you try to make your limited health last its entirety. Thankfully for those who might want to dial back on the difficulty, the game does offer a health-boosting casual option for Story Mode. Allowing you to take more hits than normal, I found switching this feature on was an ideal way to experience the story first time around. If you want the challenge right out the gate though, then you can ignore this option entirely. Of course, a game putting so much focus on music lives and dies on the soundtrack it offers and thankfully Just Shapes and Beats delivers. Boy, does it deliver. Offering a healthy dose of thirty plus tunes from a multitude of chiptune and EDM artists, you’ll be hard-pressed to find a dud in this line-up. And while the visuals might essentially come down to a small 2D square outmanoeuvring a lot of flat pink shapes, the game’s sense of style makes it feel like so much more. Whether it’s sitting back and watching the unexpectedly cute story moments or finding yourself hypnotized at everything on screen reacting in time with the music. It’s an example of simplicity done right rather than lazily. Just Shapes and Beats is gaming filtered into its purest form. While E3 may have treated us to immense cinematics, bigger worlds and even bigger promises, it’s great to be reminded that not every video game needs to be this. Sometimes it’s enough to just be able to sit down, pick up a controller and play. 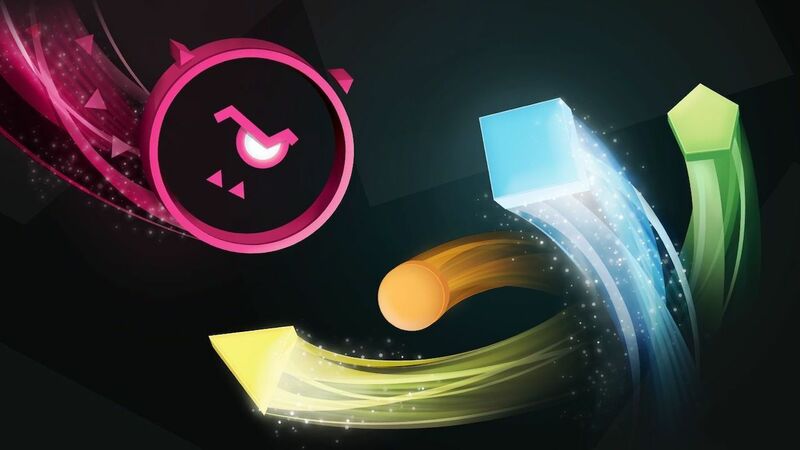 Just Shapes and Beats may be a simple concept but it’s one that combines its soundtrack and visuals to craft a truly addictive and memorable experience.